Hello, we are happy to introduce you the pro version of our famous Story Magazine theme. If you are using our free version of Story Magazine theme and you are happy with it, you can step up to a ‘pro level’ of your blogging or online magazine writing. We put together our knowledge and experience in magazine theme development and we prepared ‘pro’ version of the theme, with extended features. We included tools for better content management on the homepage and you have the possibility to create additional magazine landing pages now. These unique category pages will attract new visitors to your site and give the better reading experience of existing, returning visitors. 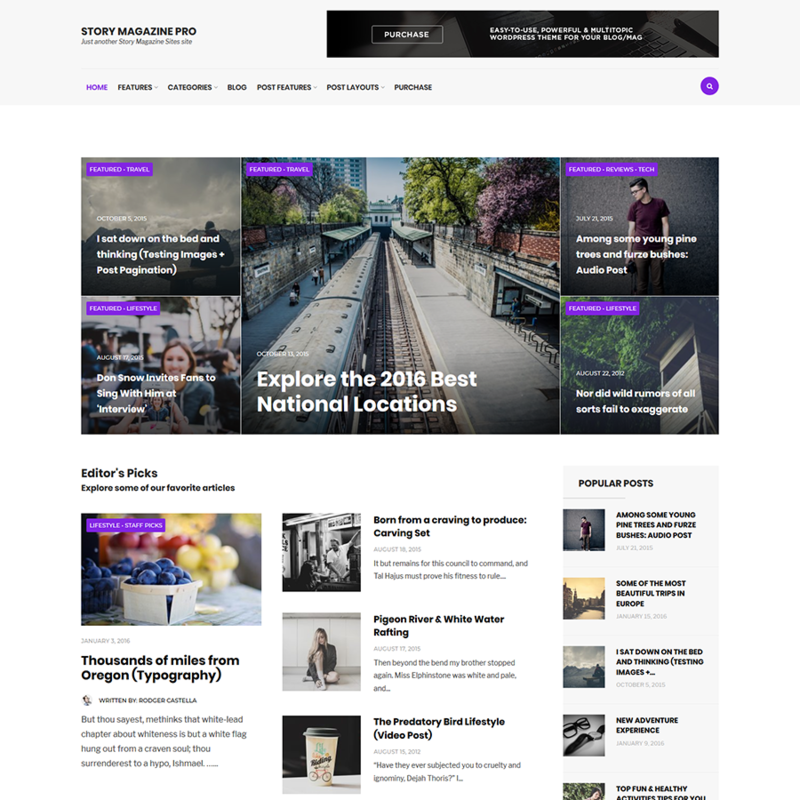 This modern and stylish magazine WordPress theme brings new aesthetic design elements which will definitely satisfy any owner of a news or e-zine website. Theme includes our powerful Master Magazine plugin, so you have possibility to create own magazine layout not just for the homepage, but you can create numerous landing magazine pages for your categories (like Fashion, Lifestyle, Food, Travel, Tech, Reviews etc.). Story magazine pro offers a lot of handy premium functions, like 3 header layouts, unlimited news layouts, countless advertisement sections to monetize your online activities, standalone theme admin panel with more than 80 design or styling options, countless Google webfonts and last but not least support for super awesome and free Master Magazine (Layout Creator) plugin! Our premium plugin is included in theme package and thanks to this plugin you can use Layout Creator functionality and create your own news layout. 14 pre-made blocks give you the power and freedom to choose how your homepage (or any other page) will look like and which articles will be displayed in the way you like. We have lots of experience with WordPress blog sphere here at the wpmasters.org (Psst, we have more than 25 000 customers). Based on these, we included 14 most popular news blocks (layouts) you can use now in Layout Creator which is part of this premium theme. Redux is a simple, truly extensible and fully responsive options framework for WordPress. Theme includes rock-solid admin panel with dozens of options thanks to this plugin. Functions like countless Google webfonts or possibility to create own color schemes are obvious for this premium theme. What else you get in the PRO version? Akismet Anti-Spam: Used by millions, Akismet is quite possibly the best way in the world to protect your blog from spam. Your site is fully configured and being protected, even while you sleep. Elementor: The most advanced frontend drag & drop page builder. Create high-end, pixel perfect websites at record speeds. Any theme, any page, any design. EWWW Image Optimizer: Reduce file sizes for images within WordPress including NextGEN Gallery and GRAND FlAGallery. Uses jpegtran, optipng/pngout, and gifsicle. MailChimp for WordPress: MailChimp for WordPress by ibericode. Adds various highly effective sign-up methods to your site. Tiled Galleries Carousel Without Jetpack: Transform your standard image galleries into an immersive full-screen experience without Jetpack.This plugin is made from Jetpack Modules. You can get the tiled galleries with Full screen carousel with out connecting to wordpress.com account. WordPress Importer: Import posts, pages, comments, custom fields, categories, tags and more from a WordPress export file. WP Review: Create reviews! Choose from stars, percentages or points for review scores. Supports Retina Display, WPMU and Unlimited Color Schemes. GA Google Analytics: Adds your Google Analytics Tracking Code to your WordPress site. Regenerate Thumbnails: Regenerate the thumbnails for one or more of your image uploads. Useful when changing their sizes or your theme. Contact Form 7: Just another contact form plugin. Simple but flexible. Maintenance: Take your website for maintenance away from public view. Use maintenance plugin if your website is in development or you need to change a few things, run an upgrade. Make it only accessible by login and password.